Its trailer was loved by all and the film was expected to do well from the day one of its promotion, instantly becoming a part of the online discussions. But there was one doubt being raised among the praises, that will the overtone of comedy kill the otherwise unusual yet thoughtful social issue talking about middle aged couples? And will the film be able to rise above the ‘in-trend’ repetitive comedies revolving around the middle class families? Thankfully BADHAAI HO never becomes the same and turns out to be much more than the expectations, handling the uncommon and less familiar issue with praiseworthy maturity along with maintaining the light and comic feel providing the entertainment. 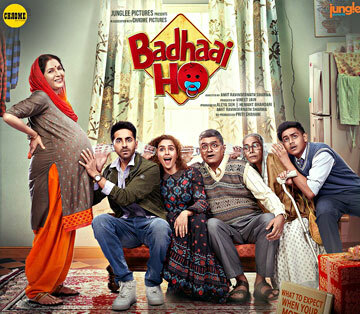 And this one factor alone, presenting the unique plot with a superfine mix of comedy and maturity together, takes BADHAAI HO much higher than all the previous small town realistic ventures more inclined towards being a comedy eyeing at the box office earnings. In other words, here we have a well-written and directed film, which is not interested in turning the elderly couple, their grown-up sons and their grandmother into typical comic characters generating laughter, but brilliantly portrays them all as real or closely knit family members tackling the sudden, embarrassing happening with an emotional understanding. Thoughtfully directed by Amit Sharma and sensibly written by Akshat Ghildial and Shantanu Srivastava, BADHAAI HO is an almost perfect film, which only falters in its one department, mentioned in the later part of the review. Otherwise, it enjoys a great collective support coming from its various technical associates be it DOP, production/art design, costumes, locations, background score or editing resulting in a sure shot winner. Where the dialogues beautifully convey emotions of the characters without going over the top, the situations seem straight out of real life reminding many or our close relatives from different age groups with their individual mindsets. Another notable feature of the script is the way it describes distinctive generations responding to the news of such untimely pregnancy in their own way, including the young students in a school. And these sub-plots contribute a lot in making the film highly relatable establishing an instant connect with the viewer. Above all, BADHAAI HO excels much above than expected due to its remarkable performances by the well-chosen cast wherein even the supporting actors perform skillfully making their presence felt, for instance the characters we get to meet in the marriage sequences. No doubt here we have another sparkling performance from Ayushmann Khurrana as the elder son, along with a natural Shardul Rana playing his school going brother and sweet Sanya Malhotra as his love interest together representing the younger brigade. However being honest, BADHAAI HO truly and entirely belongs to the elders in the cast, especially the women who simply rule the screen in their timely emotional outbursts and interactions. Leading them all we have Surekha Sikri as the grandmother and Neena Gupta as the wife-mother giving their career best performances hands down without any doubt or argument. They both are just fabulous in their individual important portrayals and don’t seem to be acting for even a second in the film to be precise. At one end, the adorable act of Surekha would truly remind many of their loving grandmothers. And on the other, Neena perfectly enacts as the tired, middle aged mother, expressing her state of helplessness so convincingly through her twinkling eyes and glares, facing the neighborhood and the relatives. The two ladies remain the spirited soul of the film besides Gajraj Rao excelling and stealing the show as the confused father in many sequences keeping his family together. To be fair, though Ayushmann is popularly known as the hero as per his star-status, the actual male hero of BADHHAI HO is Gajraj Rao who wonderfully compliments both Surekha and Neena in their scenes together. Sheeba Chadha as Sanya’s mother, leaves her own major impact in the confronting scenes and they all together put up a great comic-emotional drama as BADHAAI HO. But wait, I forgot another lady in the house, the adorable little girl who walks towards the camera in the end, becoming a part of probably the most positive climaxes of Hindi cinema leaving you with tears in the eyes. Coming to the only downer I could find, the film has unnecessary Punjabi songs stuffed in at various intervals which otherwise don’t match with any character or his/her background. The family is based in Delhi and it seems the Hindi filmmakers have made up their mind, that how can a Delhi based film be without Punjabi songs or their references, even when none of its characters have any Punjabi connection. In the process, they adapt a traditional “Wadhaiyaan” song for celebrating the events and a classic Reshma (from Pakistan) song too as “Kithe Nain Na Jodi”, which is just an average adaptation that should have been avoided. Having said that, the climax song still works fine as an end-credit item number. Anyhow, despite this avoidable flaw, BADHAAI HO is a daring, unique and a thoroughly entertaining comic-emotional drama that deserves to be seen in the theater taking the family along. Moreover BADHAAI HO rises much above the routine movies, since it teaches us the incomparable value of families and the elders living along raising a voice when needed. It teaches that nothing else can help you face the uncertainties of life other than your own family members providing you the much required courage, strength and hope at the most crucial times. Plus it teaches that probably the most lovable relationship between two women in a joint family can be between the mother and her daughter-in-law, if only the mother considers the daughter-in-law as her daughter and the daughter also showers the same love and respect in response, becoming a perfect couple. A scene in the film. so effectively conveys the message, rarely seen in the new-age family oriented projects of the present times. So don't dare miss this in this festival weekend and take the family along saying BADHAAI HO to the elderly couple with a smile. Note : Following the same old exploitive practice, the ticket prices were yet again raised by the multiplexes for the film releasing one day early on Thursday before Dussehra (on Friday). Strangely where the Consumer Product Industry organizes MEGA SALES on festivals reducing their high prices, the multiplexes ironically increase the prices exploiting the unconcerned public. Now though the people might have accepted this timely exploitation without thinking of any revolt as such, BTC will continue the tradition of deducting a big one star from such films’ not caring about their passionate viewers. The important reasons why the film gets included in BTC's Movies To See Before You Die list. Moving far beyond the routine deliberate comedies, BADHAAI HO secures its place in the BTC Must Watch list as thankfully it’s not a laugh riot at all, cunningly made just to win over the box office. The film is a delightful mix of both well-expressed comic and emotional moments close to our real life, strongly reminding us of those pleasant & memorable, life teaching Hrishikesh Mukherjee films we still cherish watching even after so many decades. So if we consider Mukherjee’s simple yet meaningful, entertaining films as cult classics, then this certainly deserves to be given the same respect and honour as a new-age gem for sure without any doubt. Secondly, BADHAAI HO brings forward a unique subject for the first time ever in our Hindi cinema, making the dare move exactly as we saw in VICKY DONOR, SHUBH MANGAL SAAVDHAN and PADMAN in the recent past. Ironically the incident of an elderly mother (in the 50s), accidentally getting pregnant is not any unheard of happening in our society as such cases have been reported often and I personally remember reading about one, back in the 90s too. Brother and sisters having a gap of 10-15 years was quite normal in the families in the last century. In fact just a few years back there was the news of a 70+ lady giving birth to a healthy child in Punjab published in the national newspaper. So the incident is nothing new, but strangely it was never adapted for a Hindi film before even as an experimental art-house project. Taking you back in time, no one dared to make a film on this available subject when there was a long trend of making family oriented emotional dramas in the 80s. The new-wave directors also didn’t think of making a film on the bold theme in the 70s and 80s. And then the loads of cable channels also shied away from producing and airing any TV serial adapting the same bringing in a positive change. Hence despite being in the news since last many decades no one dared to touch the subject till BADHAAI HO in 2018, adapting it for the first time ever in the history of Hindi Cinema making the bold move. Lastly, it certainly deserves to be there in the list as an ORIGINAL film just like VICKY DONOR, which is also rightly there because of the similar reasons. Interestingly a Pakistani TV series showed the courage to emotionally explore this rare subject before us. Recalling the other important films in the same league, SHUBH MANGAL SAAVDHAN (2017) was a remake of the same director’s Tamil film KALYANA SAMAYAL SAADHAM. And the Tamil original is proudly included in the list having its respectable place. However PADMAN could not make it being just an above average (propaganda kind of) film and also for not being a first or an original made on the path breaking subject. 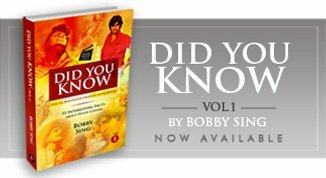 For the readers not aware of the truth, there have been three films made on the subject of Sanitary Pads in India before PADMAN including a documentary. Unfortunately the most impressive and a not to be missed, must watch film titled I-PAD still hasn’t been released and waiting for its turn lying in the cans. Friends willing to know more about the three films in details can click at the following link for the complete BTC article on the subject. Tags : BADHAAI HO Review By Bobby Sing at bobbytalkscinema.com, New Hindi Films Reviews By Bobby Sing, New Bollywood Movies Reviews by Bobby Sing, Fresh Unique Project in Family Drama Genre, Must Watch Hindi Films, Not To Be Missed Hindi Movies, Movies To See Before You Die. loved the movie and loved your review.. thank you. Glad to know you loved watching the film too Purnima and both Gajraj and Neena Gupta certainly are the real lead couple undoubtedly. The film has now become one of the rare films that has been unanimously loved by all just like VICKY DONOR. Which has a slightly different take on the subject. Thanks for the mention Dheeraj. Yes reading about the film, it seems it uses the subject as a sub-lot differently. However it still doesnt affect or hampers the courage shown by the writers and makers of BADHAAI HO presenting the theme in such a bold as well as risky manner.